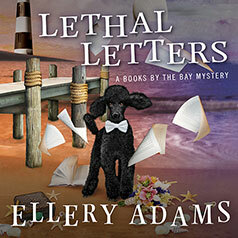 I’ve been recording Ellery Adams’ Books by the Bay series for Tantor Audio over the past several months, and have finally caught up with her! To celebrate, the author and I did interviews for the Tantor Audio blog. I was curious about a number of things after recording the series (as written so far) and Ellery was kind enough to answer my questions. Next week, Tantor will post my answers to questions that Ellery’s fans put up on her Facebook page, asking about my narration process. THIS GIVEAWAY IS NOW CLOSED. Sue S. is the randomly selected winner and the CDs will be mailed out to her as soon as I get her address. Thanks to all for entering! I give away lots of books – to find out about them in the future, please consider following this blog, or my Facebook page, or on Twitter. 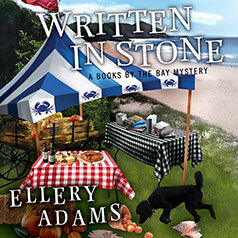 I learned that Ellery Adams loves audio books, as I do. I squeeze in time when I can and always look forward to the moment I can listen to more of a good story. 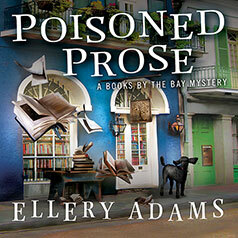 I am curious if Ellery Adams has any influence, or control, over the cover designs of her books/audios? The covers are great, eye catching, and make one want to pick them up and read or listen 🙂 Thank you! I agree with Ellery on how important the narrator is to my listening experience. Does Ellery work on more that one book at a time? I learned that the connection of authors via social media makes the lonely job of writing less lonely. Between FB and twitter, as a reader, I’ve discovered so many new authors and enjoy the chance to interact with these amazing people. Also feel inspired to try this craft myself (but fearful too). Sue, you are the randomly chosen winner of these audiobooks. I’ll email you to get your mailing address shortly. Thanks for entering, everyone, and check out my giveaway that ends at noon today, Friday, 12/18 for a chance to win WRITING ALL WRONGS! I learned that a bit of real history found its way into the books, that the author is also a fan of audios. I agree with her 100% that the narrator is very important to an audiobook. A good one will draw me in and make me want to listen to more! Thanks for the giveaway! You should give it a shot, Sue S. You never know until you try, right? Excellent question, Mary C. The answer is that I focus on writing one book at a time, but I am usually editing or researching a book in another series as well. I divide my time so as not to confuse the series. The morning is when I write and I save afternoons and weekends for research, promo, and editing. I am scheduled to write three books a year right now and I have school-aged children, so I have to be incredibly disciplined. Coffee and chocolate help with this. Lisa, I do have some input as to my cover designs. For example, when my editor is ready to have a cover conference, I must send her a list of the details I’d like to see on the cover. Because I’m a visual person, I also send links to certain things (like the cottage on the cover of Writing All Wrongs) so the Art Team knows exactly what style I’m going for. Two things never change about the covers in the Books By the Bay series. They always include a lighthouse and they always include Captain Haviland, the standard poodle. This would be a new series for me, but I have no doubt I will love it because I so enjoyed The Charmed Pie Shoppe Mysteries and can’t get enough of The Book Retreat Mysteries. Very interesting and informative interview, fun thing I learned was that her brother is an avid metal detector hunter. I don’t think I’ve ever know anyone in real life who had a metal detector ;-). And I agree audio books are great. Nothing better than listening to a good book while I walk. Thanks for the giveaway. I love learning about how author’s get their ideas and weave their tales. I love this series and Ellery’s development of her characters draws you in. I have read all the books in this series and eagerly await more. Having one on audio for my driving pleasure would be awesome! I learned — along with Ellery — that you as the narrator must do plenty of up-front research on the proper pronunciation of places and names – e.g, Stede Bonnet! Unless I missed this part — how long do you spend researching prior to narrating? And do you research the whole book up-front, or portion by portion? I try to do all the research before I record, Cynthia. In the case of Stede Bonnet though, I read it incorrectly (bad source on my part, luckily Ellery found a better one) but I was able to correct it in what we call pickups where the narrator re-records any sentences read incorrectly. But it’s better to get it right the first time. For more on how I prepare, check out next week’s post at Tantor! I learned that Ellery Adams wrote poetry, which I didn’t know. This is a great series and I love listening to audiobooks when I do housework or needlework. Thanks for the chance. I learned that there are real bits of North Carolina history in the books—I’ll have to watch for those. Thanks for the cotest. I love this series and think listening to them would give me a new perspective. I learned that Ellery likes audio books. Thanks so much for the giveaway! I love this series and also many of Ellery’s other series. It was interesting to find out that she, like Olivia use metal detectors. I love this series. I learned that she likes using metal detectors. I have always wanted to use one. Thank you for the giveaway. Love audiobooks, I like the fact that these story has some info about my state , North Carolina. I love the fact that this audio will talk about my state of North Carolina. That is so cool. Yes, it’s been fun for me Kiki, when the author talks about places I know – like Mama Dip’s restaurant in Chapel Hill, and the art museum in Raleigh! I would love to share Ellery’s genius with some of my audio book loving friends. I’m giving away the CDs so you CAN share them! I enjoy Ellery’s books but have not listened to the audio books. I like that Ellery writes a lot of what she knows. I have not visited North Carolina in person, although I like visiting the state through books. Thanks for narrating and thanks to Ellery for writing. Our car is never with out a book to listen to, its a family tradition carried on my our son and daughter. It was a very interesting interview, I now have a better insight on you as the writer and your creations, who are all very clear in my mind…. as I read all your books. The choice of reader for audio books is a very important one, as I will stop listening if the voice or manner puts me off. I hope I win….Merry Christmas everyone. Merry Christmas to you, Lynda! Interesting to read the bit about the first few weeks of motherhood. Also, love listening to audiobooks in the car! My son is hoping to change schools to attend a charter school 30 minutes from our home. Knowing that one of my favorite writers makes a similar drive every day, armed with audiobooks, gives me some optimism that I don’t need to be afraid of the drive. I also learned that giant pickle jars are super useful for various collections. I might need to invest in some for my own trolls. I have to agree that listening to audio books is a great way to “read” a book when you can’t actually hold the book and read. I love listening in the car, when I’m cooking, when I’m cleaning or doing dishes. It’s a great way to pass the time quickly and I think if you have a wonderful narrator, it can bring the story to life even more than when you’re reading. I do agree that without an outstanding or talented narrator, it’s not interesting and can make me stop listening. I actually listened to a book cd during a long car trip and the narrator was trying to do different voices for each character and it failed. We always laugh about how horrible the person was. I guess it really wasn’t a job that suited them. My question is, does she get to pick who narrates her books?